I am soba obsessed. 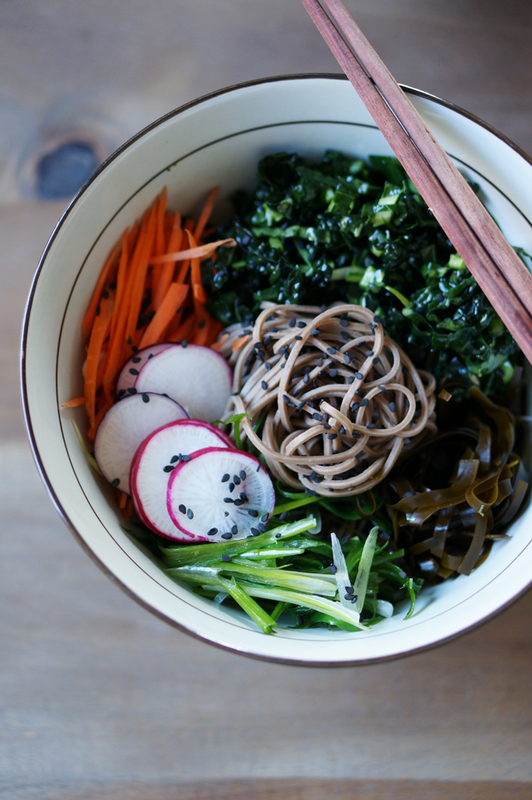 This toothsome buckwheat noodle is versatile, delicious and healthy. I normally get my soba fix at a local restaurant in LA that makes them from scratch, but I will often make a cold soba from dried noodles during the summer. It’s one of my pantry staples. 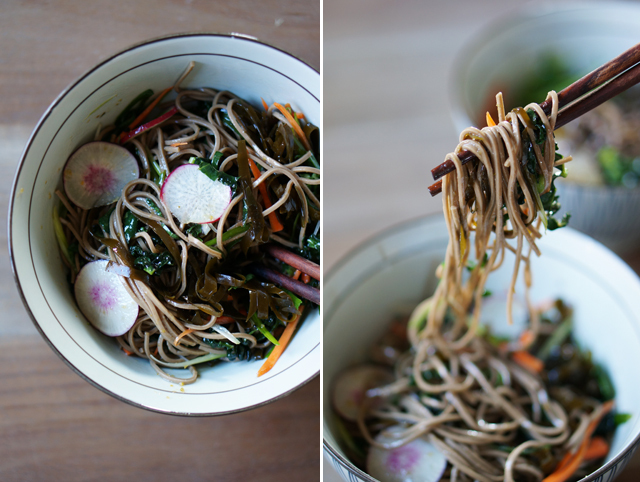 This soba salad recipe is one of those recipes that I created from trying to use up items in my fridge and luckily it worked out wonderfully. The star of this dish is really the yuzukosho, which is a Japanese paste made of yuzu— a citrus–and spicy pepper. It is fragrant, spicy, salty and downright delicious. While I usually use it as a side condiment on fish or beef, I made it into a dressing here. It’s subtle, but has such a unique flavor. This recipe makes 4 servings and the great thing about this recipe is that you can add or substitute any ingredient you prefer. Next time I’m going to add seared tofu and edamame! Start by prepping your vegetables. 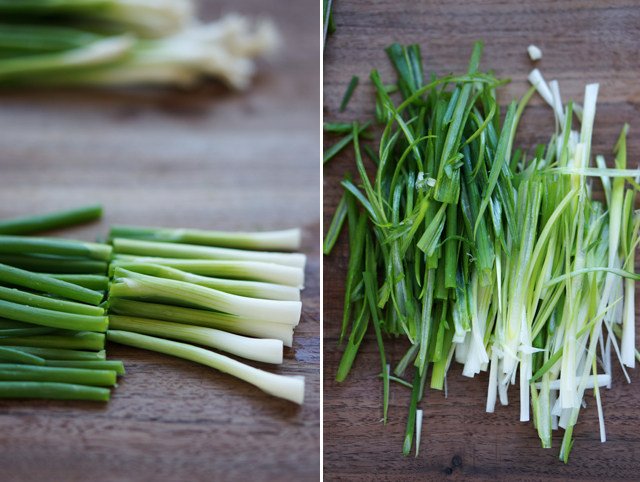 To julienne green onions, cut them into thirds with roots trimmed. For white-light green portion, slice in half lengthwise and lay the flat portion on the cutting board. Line them together parallel and slice halves into thin strips. For green portions, line them together tightly parallel and slice into thin strips. Reydrate seaweed according to your package instructions. Cooking time will depend on the type of seaweed you buy. 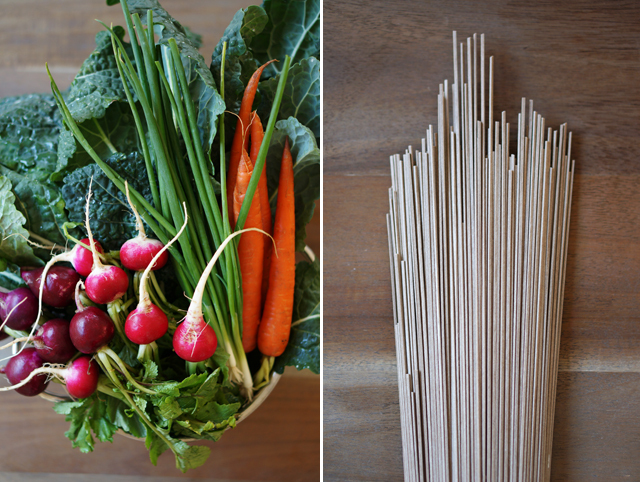 Thinly slice radishes and julienne carrots. Cut kale into ribbons. Cook soba according to instructions on package. Rinse under cold water and drain as much water off as possible. 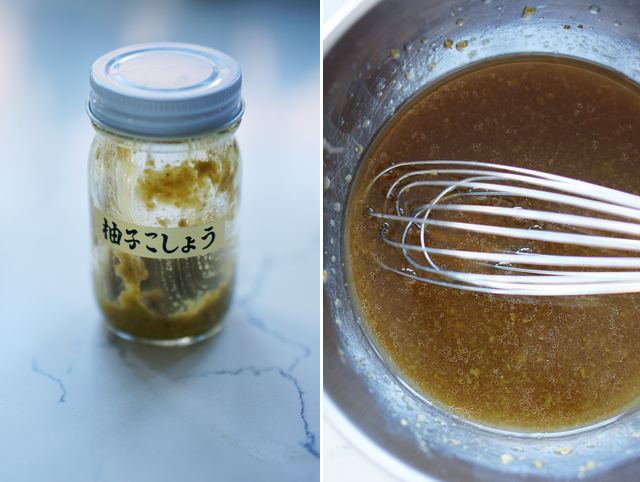 To make the dressing, combine yuzukosho, sugar, sesame oil, soy sauce, vinegar and whisk. Stream in oil while whisking. Taste to see if it needs more salt. I didn’t add any salt as my yuzukosho and soy sauce provided enough. Use about 1/4 of the dressing and dress the kale. I find letting it marinate in the dressing for a while helps soften the kale and take away that raw bite. 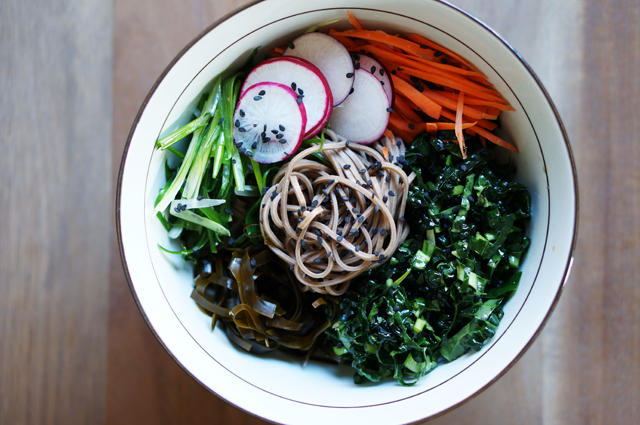 To assemble 4 individual bowls, place 1/4 of the drained soba in each bowl and an equal amount of kale on the side. 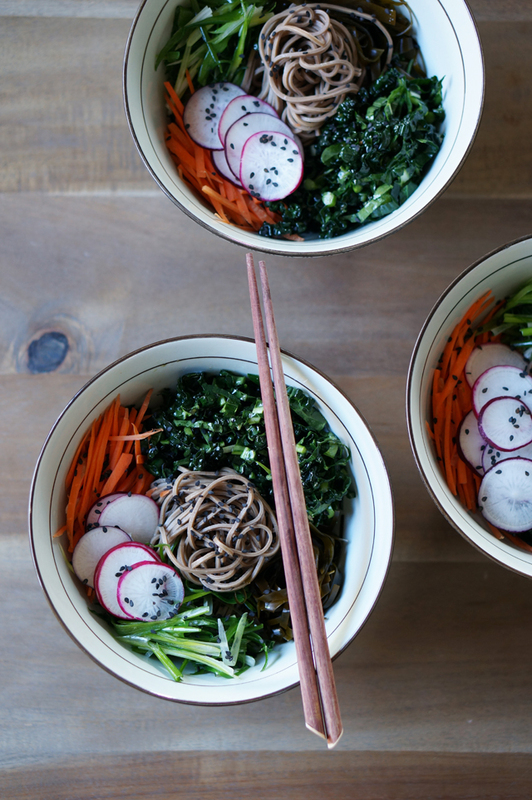 Line the bowl with a handful of carrots and handful of scallions. 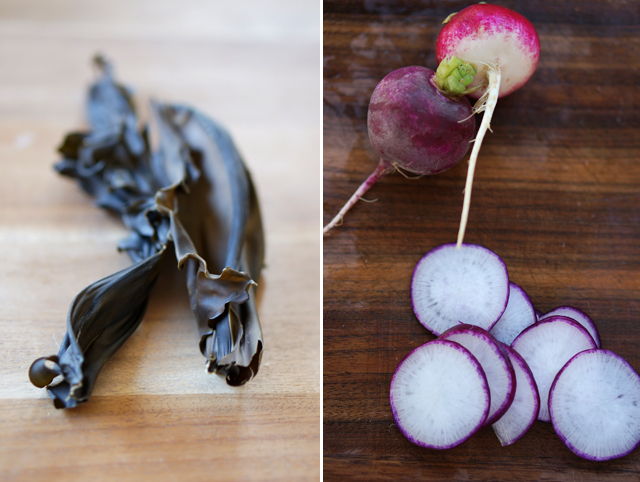 Add a few radish slices and small bunch of seaweed. Garnish with sesame seeds. 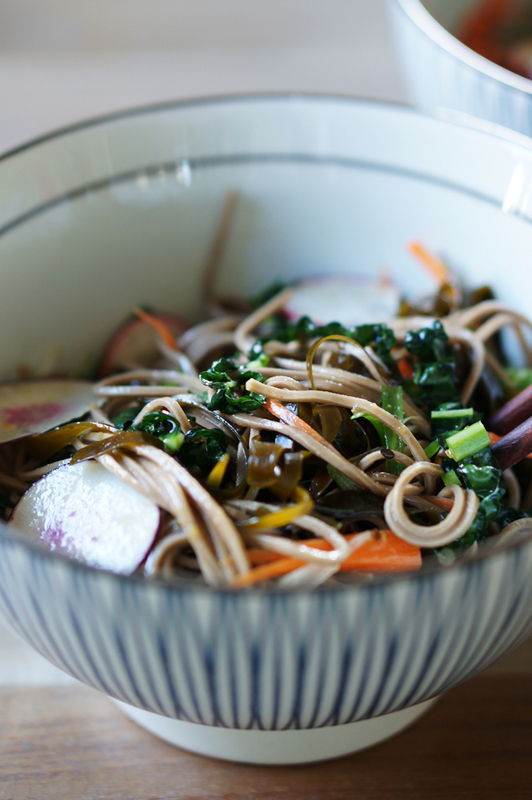 Dress the soba salad. And enjoy this flavorful and light, yet hearty dish! Cool photos and tasty recipe :)Thank you:) Today on my blog pineapple: ) My parents always told me not to play with food, but by looking on food photography, I think they might be wrong. For me food, is always one of the greatest inspirations, very tasty inspiration: )!!! Do you also think so? looks really good!!! I will try the recipe this weekend!!! 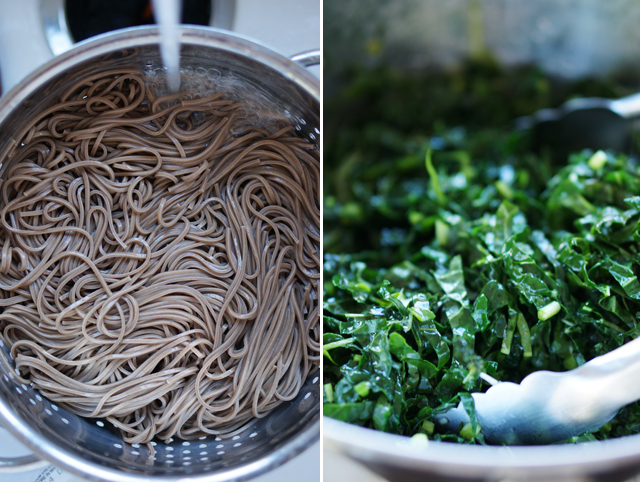 So I have yet to try soba noodles, but I’m in love with buckwheat so I imagine I would love them! This salad looks so awesome, noodles in salad really take it up a notch. soba is one of my favorite too..i have not heard about this pasta but sounds very delicious.